Is everyone ready for Thanksgiving? Minus the whole shopping part my menu is planned and ready to be executed! I cook for a crowd every year. Thanksgiving is one of my favorite holidays. I just love the family gathering around good food. One thing I don't have to worry about is dessert. Thank goodness! I so didn't want to bake at all ever. The end! 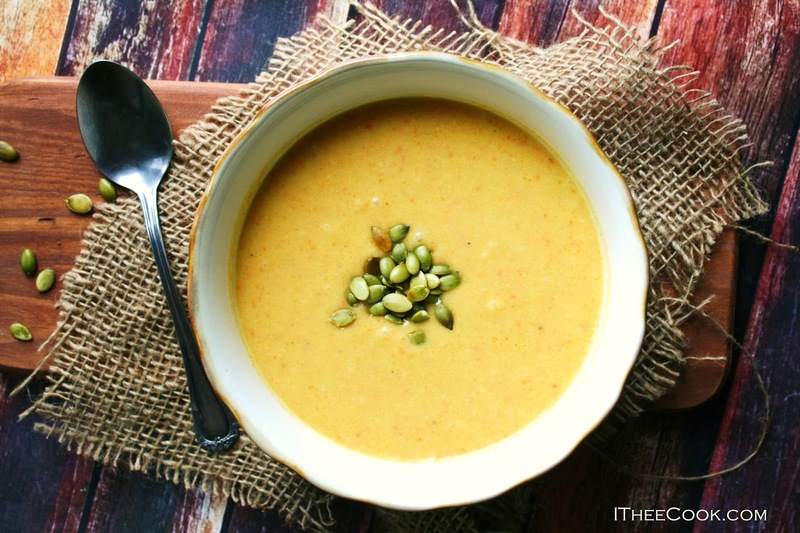 Glorious butternut squash is roasted to perfection and turned into this delicious soup. I make a few different versions of this soup. Like this one. I never roast the squash cut up. I find that the ends get a little brown and dry. Plus it's so much prettier roasted whole. 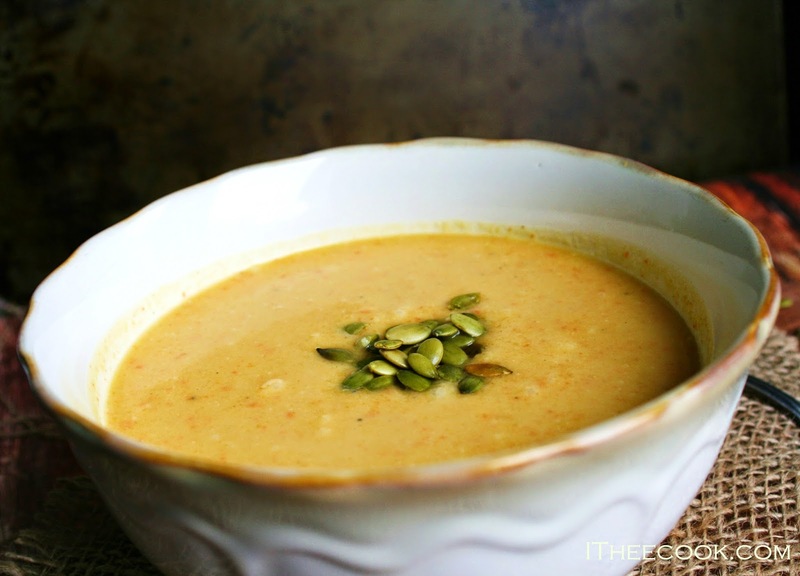 Combined with onion, carrots and celery all pureed into a smooth and silky hot and delicious soup. A nice addition to you Thanksgiving table, this soup will surely impress your guests. If you aren't hosting you can totally make this before hand even freeze it and take with you to your host. How awesome would that be? Talk about impressive. It looks totally gourmet and is so simple to make. Heat the olive oil in a large saucepan over medium heat until hot. Add the onion, celery, carrot and saute until soft but not brown, about 10 minutes. Season with salt and pepper. Add the chicken stock and; bring to a boil. Simmer for several minutes. Stir in reserved squash until smooth; simmer gently to let the flavors marry, about 10 minutes. Puree the soup using an immersion blender or in a blender until smooth. Return the soup to the pan and reheat gently. Add the half-and-half. Adjust the seasoning with salt and pepper. Top each serving with pumpkin seeds. I couldn't agree more Ashley! 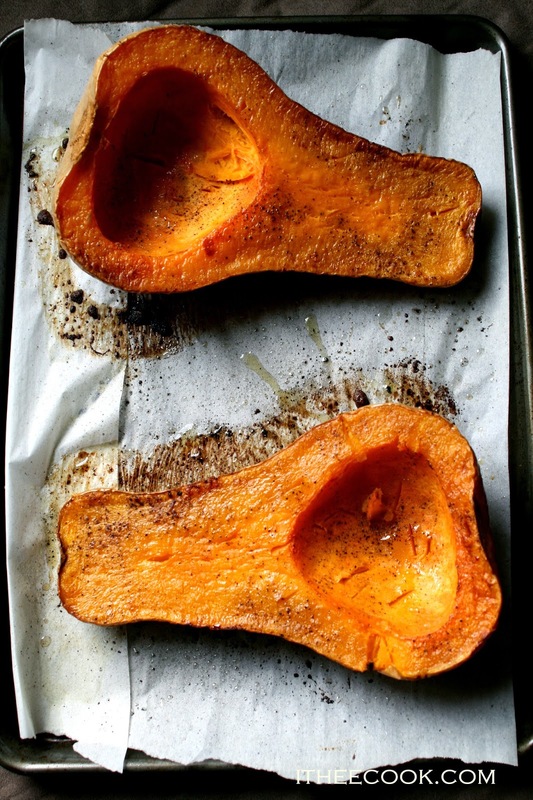 I love soups, roasting the squash whole is a great idea. It looks delicious! Thanks for linking up to Sweet and Savoury Sunday, stop by and link up again. Have a great day! !